For the Egyptian food, see Dukka. Dukkha (Pāli; Sanskrit: duḥkha; Tibetan: སྡུག་བསྔལ་ sdug bsngal, pr. "duk-ngel") is an important Buddhist concept, commonly translated as "suffering", "pain" or "unsatisfactoriness". It refers to the fundamental unsatisfactoriness and painfulness of mundane life, and inspires the Four Noble Truths and nirvana doctrines of Buddhism. The term is also found in scriptures of Hinduism, such as the Upanishads, in discussions of moksha (spiritual liberation). Dukkha (Pali; Sanskrit duḥkha) is a term found in ancient Indian literature, wherein states Monier-Williams, it means anything that is "uneasy, uncomfortable, unpleasant, difficult, causing pain or sadness". It also refers to a concept in Indian religions about the nature of life that innately includes the "unpleasant", "suffering," "pain," "sorrow", "distress", "grief" or "misery." The term Dukkha does not have a one word English translation, and embodies diverse aspects of unpleasant human experiences. It is opposed to the word sukha, meaning "happiness," "comfort" or "ease." The ancient Aryans who brought the Sanskrit language to India were a nomadic, horse- and cattle-breeding people who travelled in horse- or ox-drawn vehicles. Su and dus are prefixes indicating good or bad. The word kha, in later Sanskrit meaning "sky," "ether," or "space," was originally the word for "hole," particularly an axle hole of one of the Aryan's vehicles. Thus sukha … meant, originally, "having a good axle hole," while duhkha meant "having a poor axle hole," leading to discomfort. The word dukkha is made up of the prefix du and the root kha. Du means “bad” or “difficult.” Kha means “empty.” “Empty,” here, refers to several things—some specific, others more general. One of the specific meanings refers to the empty axle hole of a wheel. If the axle fits badly into the center hole, we get a very bumpy ride. This is a good analogy for our ride through saṃsāra. Viparinama-dukkha, the dukkha of the changing nature of all things. This includes frustration of not getting what you want. Sankhara-dukkha, the dukkha of conditioned experience. This includes "a basic unsatisfactoriness pervading all existence, all forms of life, because all forms of life are changing, impermanent and without any inner core or substance. "[web 1] On this level, the term indicates a lack of satisfaction, a sense that things never measure up to our expectations or standards. Not getting what is wanted is dukkha. In conclusion, the five clinging-aggregates are dukkha. 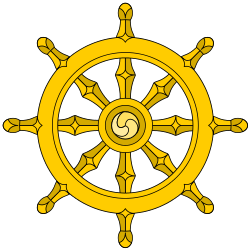 Dukkha is one of the three marks of existence, namely dukkha ("suffering"), anatta (not-self), anicca ("impermanence"). The Buddhist tradition emphasizes the importance of developing insight into the nature of dukkha, the conditions that cause it, and how it can be overcome. This process is formulated in the teachings on the Four Noble Truths. In Hindu literature, the earliest Upaniṣads — the Bṛhadāraṇyaka and the Chāndogya — in all likelihood predate the advent of Buddhism. [note 3] In these scriptures of Hinduism, the Sanskrit word duḥkha (दुःख) appears in the sense of "suffering, sorrow, distress", and in the context of a spiritual pursuit and liberation through the knowledge of Atman (soul, self). The concept of sorrow and suffering, and self-knowledge as a means to overcome it, appears extensively with other terms in the pre-Buddhist Upanishads. The term Duhkha also appears in many other middle and later post-Buddhist Upanishads such as the verse 6.20 of Shvetashvatara Upanishad, as well as in the Bhagavada Gita, all in the context of moksha. [note 6] The term also appears in the foundational Sutras of the six schools of Hindu philosophy, such as the opening lines of Samkhya karika of the Samkhya school. Both Hinduism and Buddhism emphasize that one overcomes duḥkha through the development of understanding. [note 7] However, the two religions widely differ in the nature of that understanding. Hinduism emphasizes the understanding and acceptance of Atman (self, soul) and Brahman, while Buddhism emphasizes the understanding and acceptance of Anatta (Anatman, non-self, non-soul) as each discusses the means to liberation from Dukkha. ↑ Paul Williams: "All rebirth is due to karma and is impermanent. Short of attaining enlightenment, in each rebirth one is born and dies, to be reborn elsewhere in accordance with the completely impersonal causal nature of one's own karma. The endless cycle of birth, rebirth, and redeath, is samsara." ↑ See, e.g., Patrick Olivelle (1996), Upaniṣads (Oxford: Oxford University Press), ISBN 978-0-19-283576-5, p. xxxvi: "The scholarly consensus, well-founded I think, is that the Bṛhadāraṇyaka and the Chāndogya are the two earliest Upaniṣads.... The two texts as we have them are, in all likelihood, pre-Buddhist; placing them in the seventh to sixth centuries BCE may be reasonable, give or take a century or so." ↑ Max Muller translates Duḥkhatām in this verse as "pain". ↑ This statement is comparable to the Pali Canon's Dhammacakkappavattana Sutta (SN 56.11) where sickness and death are identified as examples of dukkha. ↑ For a general discussion of the core Indian spiritual goal of developing transcendent "seeing," see, e.g., Hamilton, Sue (2000/2001), Indian Philosophy: A Very Short Introduction, (Oxford: Oxford U. Press), pp. 9-10, ISBN 978-0-19-285374-5. ↑ Malcolm Huxter (2016). Healing the Heart and Mind with Mindfulness: Ancient Path, Present Moment. Routledge. p. 10. ISBN 978-1-317-50540-2. , Quote: " dukkha (unsatisfactoriness or suffering) (....) In the Introduction I wrote that dukkha is probably best understood as unsatisfactoriness." 1 2 Peter Harvey (2015). Steven M. Emmanuel, ed. A Companion to Buddhist Philosophy. John Wiley & Sons. pp. 26–31. ISBN 978-1-119-14466-3. ↑ Carol Anderson (2013). Pain and Its Ending: The Four Noble Truths in the Theravada Buddhist Canon. Routledge. pp. 1, 22 with note 4. ISBN 978-1-136-81332-0. , Quote: "(...) the three characteristics of samsara/sankhara (the realm of rebirth): anicca (impermance), dukkha (pain) and anatta (no-self)." 1 2 3 Brihadaranyaka Upanishad 4 April 2014, trans. Patrick Olivelle (1996), p. 66. 1 2 Paul Deussen (1980). Sixty Upaniṣads of the Veda, Vol. 1. Motilal Banarsidass (Reprinted). pp. 482–485, 497. ISBN 978-81-208-1468-4. 1 2 Monier-Williams 1899, p. 483. 1 2 3 Thomas William Rhys Davids; William Stede (1921). Pali-English Dictionary. Motilal Banarsidass. pp. 324–325. ISBN 978-81-208-1144-7. 1 2 Walpola Rahula 2007, Kindle Locations 542-550. ↑ Sargeant 2009, p. 303. ↑ Goldstein 2013, p. 289. ↑ Walpola Rahula 2007, Kindle locations 524-528. ↑ Dalai Lama 1998, p. 38. ↑ Gethin 1998, p. 61. ↑ Smith & Novak 2009, Kindle location 2769. ↑ Keown 2000, Kindle Locations 932-934. ↑ Bhikkhu Bodhi 2011, p. 6. ↑ Williams 2002, p. 74-75. ↑ Paul Deussen (1980). Sixty Upaniṣads of the Veda. Motilal Banarsidass (Reprinted). pp. 188–189. ISBN 978-81-208-1468-4. ↑ Chandogya Upanishad 7.26.2, trans. Patrick Olivelle (1996), p. 166. ↑ Paul Deussen (1980). Sixty Upaniṣads of the Veda, Vol. 1. Motilal Banarsidass (Reprinted). pp. 112, 161, 176, 198, 202–203, 235, 455, etc. ISBN 978-81-208-1468-4. ↑ Paul Deussen (1980). Sixty Upaniṣads of the Veda, Vol. 1. Motilal Banarsidass (Reprinted). p. 326. ISBN 978-81-208-1468-4. ↑ Paul Deussen (1980). Sixty Upaniṣads of the Veda, Vol. 1. Motilal Banarsidass (Reprinted). p. 305. ISBN 978-81-208-1468-4. ↑ Peter Harvey (2013). The Selfless Mind: Personality, Consciousness and Nirvana in Early Buddhism. Routledge. pp. 34, 38. ISBN 978-1-136-78336-4. Kalupahana, David J. (1992). A history of Buddhist philosophy. Delhi: Motilal Banarsidass Publishers Private Limited. Lopez, Donald S. (2001). The Story of Buddhism. HarperCollins. Nanamoli, Bhikkhu (1995). The Middle Length Discourses of the Buddha: A New Translation of the Majjhima Nikaya. Boston: Wisdom Publications. ISBN 0-86171-072-X. Potter, Karl (2004). The Encyclopedia of Indian Philosophies, Vol. IX: Buddhist philosophy from 350 to 600 AD. Ronkin, Noa (2005). Early Buddhist Metaphysics: the Making of a Philosophical Tradition. Routledge.